My mother lives in Perth, and the girls have enjoyed spending time with her since we got back from Indonesia. She sings, encourages craft activities, creates adventures and often has a treat or two to offer. Today we spent the day together at a new local park — Yokine Playspace. The spinning disk at Yokine Playspace was the main attraction for our girls. Lana loves to spin — for long, long times. I get dizzy just watching her go around and around! Delaney changed her name to Lana (pronounced “Lahna”) in May while we were visiting Indonesia. We were staying in a bungalow on Gili Air with Roselin (David’s mother), and Delaney started insisting that her name was Lana. Because of her childish accent, I had to seek clarification whether she was Elana or Alana, but it was definitely Lana. And for a week or so, Delaney would forget her moniker too, but she remembered her name had changed. “Delaney is not my name. What is my name?”, she would ask me. Then she began introducing herself as Lana, correcting me if I forgot and correcting her sisters if they slipped up! Once it became clear that Delaney was adamant about being called Lana, we all made the effort to stop calling her Dell or Delaney. Now we call her Lana easily, and the girls correct each other (and me!) when we forget. The girls appreciate the extra time with Manou. Aisha, especially, returns to her during the day for cuddles. Finally a playspace-designer has watched children climb back up the slide and thought about how to make it more fun (and safe)! This is the first slippery-dip with climbing aids that we've encountered. 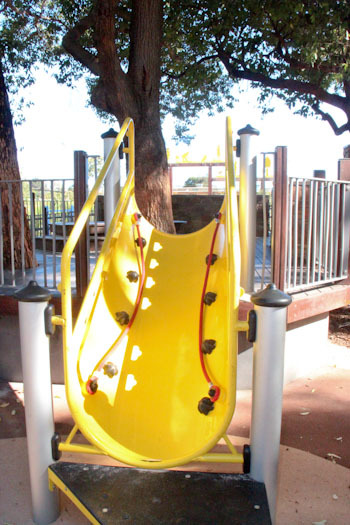 Featuring lots of wooden sculptures as well as sleek metal equipment, the Yokine Playspace is also notable because it contains the sound sculpture work of Kim Bowman. Some of the instruments haven’t been scaled down for smaller children, which means they tend to be played by the adults instead of the kids, but the wind and percussion instruments built from wood and metal are fun to experiment with. Our girls loved spending the day outdoors with Manou. 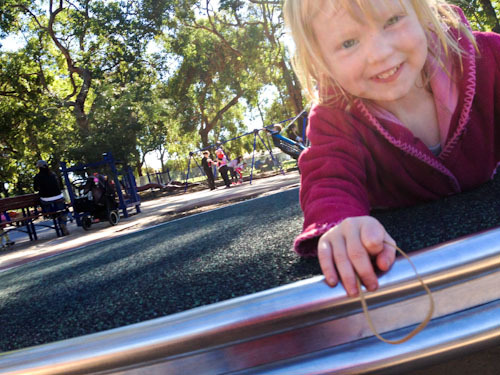 We’ve had such bright sunny days here in Perth, perfect for exploring the city’s playspaces! This is the last week before school holidays, so we’ll continue to visit attractions before the crowds and I’ll think about driving us away next week. Have a wonderful visit with your mom! Good to see you again, Lauren <3 And tell Lana I love her name! 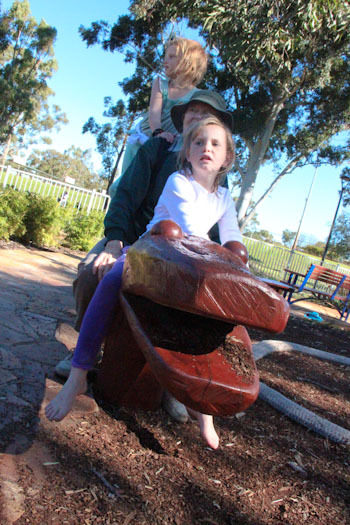 My kids loved the Yokine playspace – have you checked out the Ivey Watson playground at Kings Park, that was a huge favourite when my four were littlies!